Although statistical analysis can also be applied in 3D face shape recovery, we have additionally worked on the development of geometric approaches for the monocular-based localization of humanoid robots, finding applications in both navigation and object reconstruction tasks. This is more related with the 3D reconstruction of the environment sensed by the robot. The main idea here is to profit on the accuracy of 3D-to-2D visual odometry strategies so that full 3D models of objects can be approximated from the march of a humanoid robot. It is also important to consider the closed-loop of the visual information with the linear and angular velocities of the robot. The following image shows some of the results corresponding to the application of 3D object reconstruction from a video sequence obtained by a humanoid robot. The task is to generate a set of views of a real world object while following a circular trajectory, so that healthy segmentation of the object can later feed a space carving algorithm for 3D reconstruction of the object with measuring dimensions matching those of object in the real world. Pablo Arturo Martínez, David Varas, Mario Castelán, Margarita Camacho, Ferran Marques and Gustavo Arechavaleta. 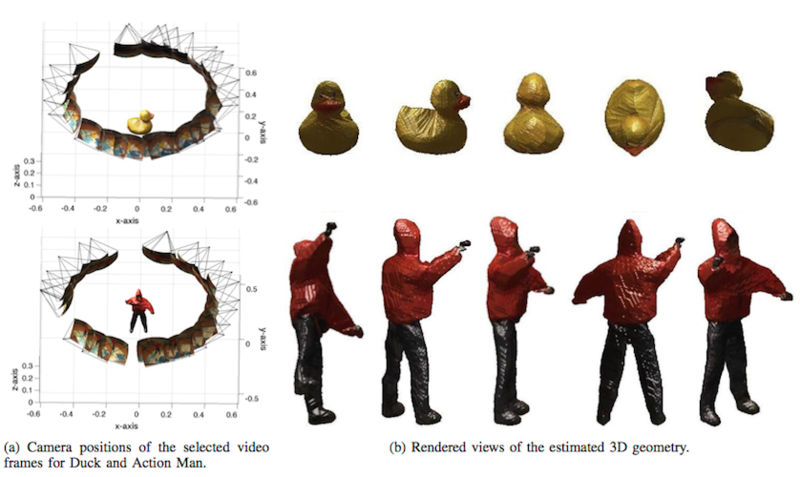 3D shape reconstruction from a humanoid generated video sequence, Proc. IEEE-RAS International Conference on Humanoid Robots, 699-706 (2014). Josafat Delfin, Oscar Mar, Jean-Bernard Hayet, Mario Castelán and Gustavo Arechavaleta. An active strategy for the simultaneous localization and reconstruction of a 3D object from a humanoid platform, Proc. IEEE-RAS International Conference on Humanoid Robots, 384-389 (2012).